Oh hey! I failed at blogging this week but I am here today and today is the most important thing right? Yes, because it is Friday and all things are possible now that the weekend is upon us! I actually had a pretty good week. I am still working I know and they seem to be finding a steady stream of more work for me to do. Still waiting on news back from the big interview last week. Ugh. I am frustrated. I know the recruiter said a couple of weeks but really? Do they not appreciate that I am waiting on pins and needles? I guess not. Oh well, no news is good news. Until I get the "we have decided to go with another candidate" call I am still positive that it's mine. So let's get to my five on Friday. Linking up with those farm gals Karli and Amy for the fun. Oh and also Amanda because these def qualify as favorite things of the week. Got a new tattoo this week...spur of the moment decision kinda.... although I have been wanting a mandala for some time. I follow an artist from PA on instagram and she just happened to be here doing a guest spot at the awesome Ink and Dagger Tattoo and was able to squeeze me in. I call that fate. She had some amazing designs in her book but this is what I settled on. 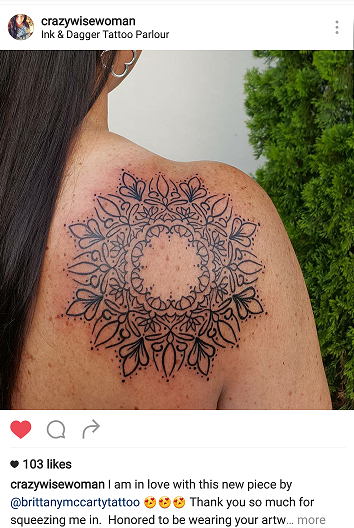 I am in love with black work! So now I have a new beautiful piece courtesy of Brittany McCarty. If you live in PA check her out. If you live anywhere else, you are probably in luck because she travels! After I got back from camping last weekend to say I felt a little grungy and dirty would be an understatement. Perfect timing to try out the new Skin Detoxifying Clay Mask by Valentia that was sent to me by the lovely folks at Brandbacker! This is the third item I have tried from Valentia and another winner for me. I love a good mask though. This one is a clay mask that goes on cool and creamy and dries within 15 minutes. Using a warm washcloth to take it off also provides a nice exfoliating effect. It feels a little tingly as it starts to dry and tighten but totally left my skin feeling clean and smooth. As with all of their products I love that it is all natural and cruelty free. Oh and bonus... it smells great, clean and kind of fruity. Definitely give this one a try by clicking the link here. I can't say enough good things about the Valentia products I have tried. If you would like to try any of the Valentia Products please use code REFRESH35 for 35% off of your order. Click here. 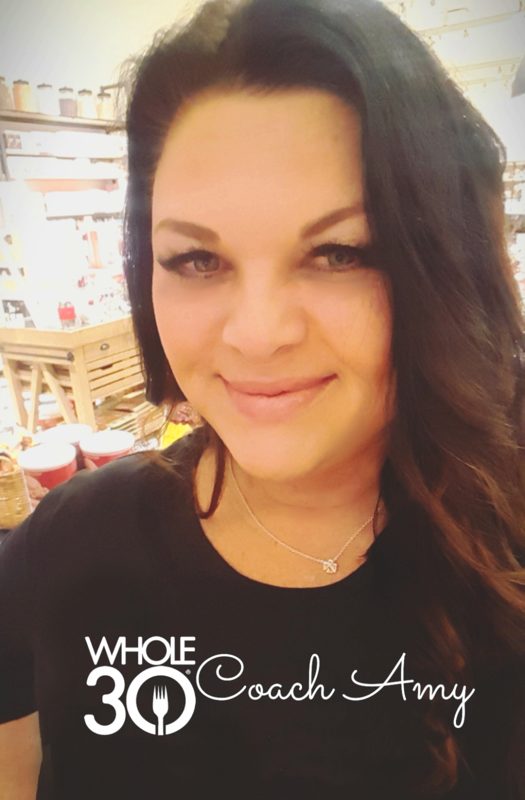 Have you guys heard about Helene's new website for bloggers? 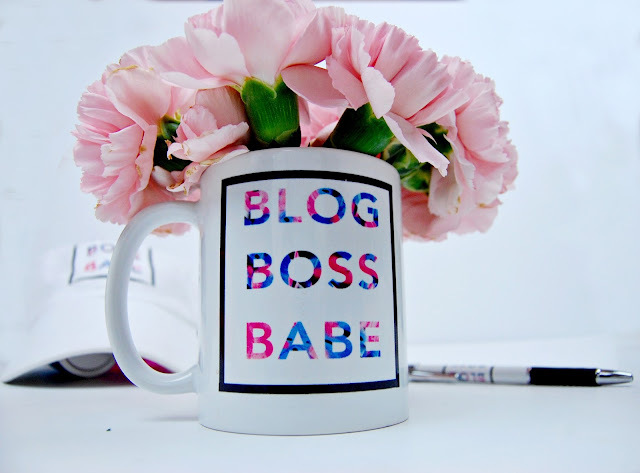 Blog Boss Babe launched this week and is a really cool resource for every single aspect of blogging. I am jealous of all of the people just starting out who will have this wealth of knowledge and support, I was completely clueless. I still kind of am but I am always looking for ways to learn, grow, improve my blog. And... I ain't got time to reinvent no wheel so if I can learn from those who are doing it, great. I signed up because there are some very specific things I would like to do with my blog and I know Helene and her group of mentors can provide the info I need. If you are interested please go check it out by clicking here. Ok, so I can't stop won't stop with the fringe and tassel addiction I have going on. I desperately need a new basic crossbody bag and although I am really looking for a blush color I saw this and had to have it. The Kailey Crossbody Bag from Nine West. Since 90% of my wardrobe is black I am sure it will be in constant rotation this summer! Use this code to get $10 off your next Nine West purchase! Is it bad that all I want to wear are T-Shirts and Tanks? Don't curr... Another thing... I could live on brunch alone 24/7. I will be brunching tomorrow in fact here. Watch my snaps and IG for droolworthy photos. I won't have this in time but I snagged it this week. Could not resist. 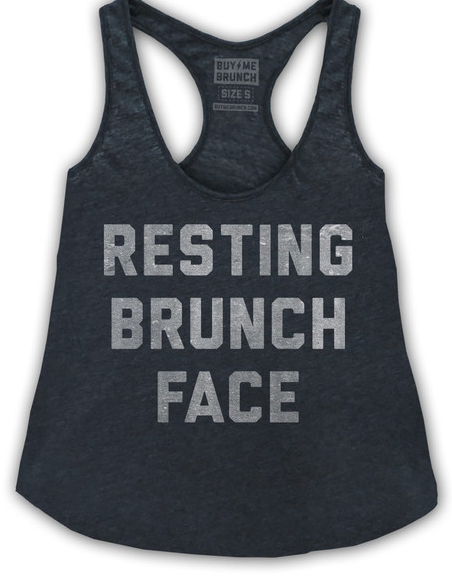 Buy Me Brunch is my all time fave for cute, comfy tees and tanks. Pricey yes? So what. It's just money, we'll all make more. **Sponsored post powered by Brandbacker. Wow, your tattoo turned out amazing! Your tattoo is so beautiful! I love it!!!! Totally checking out that mask, I am all about more natural products. Hope you have a great weekend! I'm following on ig a Sydney-based female tattoo artist and am lusting over her work. It's only a matter of time (actually, it's a matter of finding the money) before I get a tattoo from her. IG is awesome for stuff like this!! Love your new tattoo! It's so pretty. And I love that tassel purse. Can I just have all the tassels? BTW, I co-host a Friday linkup called High Five for Friday. I'd love it if you'd join us next Friday! Nice tat! I'll have to check out that blog resource site. I'm always up for improving my blog.